They're finally here! 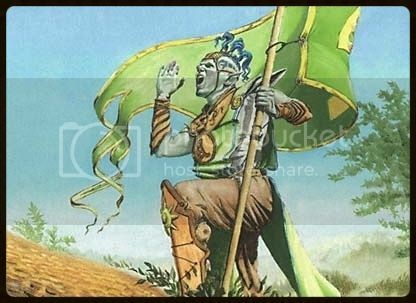 No, I'm not talking about the Eldrazi from Battle for Zendikar (although, the Tribal Evaluation of the newest set is coming, too), I'm referring to the interviews to the 2014 Tribal Champions, that debuted after just a short 9-month delay (they're like babies!) with 2014 Ultimate Champion MisterMojoRising, whose real life, musical tastes and deckbuilding strategies you now have a chance to explore here. A twin interview to 2014 Player of the Year romellos will follow suit early next week, going live at this address. As for the pending Purification of AJ_Impy's winning Eldrazi deck from two weeks ago, I ultimately decided not to purify anything; if a similar Eldrazi deck should end undefeated again (I remind you that it never had before, in ANY subformat), then I'll likely purify Emrakul, mostly for symbolic purposes. The reason behind this choice is what I stated in last week's comment section (under the guise of the tournament personified): the Purification process is a roll-the-wheel kind of game in itself, not an attempt to "fix Tribal Wars"; and the intent is to level the playing field, not cripple any Major League tribe no matter what (plus we already know the Major League/Underdog lists need revisiting). Eldrazi, in this context, are the weak party, being a tribe that never had much success before. I defined these unspoken rules of thumb in the Pure Tribal page so it's clear for everybody. And about the Cloudpost decks, please don't start a war for nothing. They've been around forever, never did much in the way of consistent winning. In fact, I think the number of undefeated results from a Cloudpost deck is pretty low (Construct, Golem and Myr all have just 2 wins each; Scarecrow 3, not sure they've been all achieved within a Cloudpost shell). I'm used to play 12- or 16-post myself, so I know how many games you end up not finding the amount of mana your deck requires fast enough to stop the aggro assault from the other side of the table. It's not even a matter of land hating, those decks have a history of defeating themselves. I'd also like to compare Tron and Cloudpost's mana ramping in early turns under perfect conditions. Turn 1 Post: Drops Cloudpost. Available mana: 0. Turn 1 Tron: Drops any Urza land. Available mana: 1. Drops Expedition Map. Turn 2 Post: Drops Vesuva. Available mana: 0. Turn 2 Tron: Drops any other Urza land. Available mana: 2. Cracks the Map. Turn 3 Post: Drops Glimmerpost. Available mana: 7. Casts All Is Dust. Turn 3 Tron: Drops the Urza land fetched with Map. Available mana: 7. Casts All Is Dust. You can see how Post up until that point works as if its lands were needed in a triplet, too, because you can't have 7 mana by turn 3 in any other combination. But it's actually worse than Tron, because you need those 3 lands in that exact order (which translates into a worse chance of happening) or else you wind up not ramping at all. In particular, you absolutely need Cloudpost first hand, as Vesuva can't sustain itself, so without a Cloudpost you'll end up having to play a first-turn Glimmerpost (wasting the lifegaining), or a land that doesn't help the ramping at all; and if you do so, and then luckily draw into that Cloudpost (about 7.5% odds), and then drop Vesuva turn 3, you'll untap with just 3 mana by then, which, if you didn't play first, means the opponent has had 4 turns worth of attacks. Now, most high-profile aggro decks are more than capable of finishing you in 4 turns, or at least putting you in a unrecoverable situation. Sure it feels powerful when things go the right way and you cast that early All Is Dust; and Post is clearly more powerful in the long run, able to power up Emrakul-level threats more consistently than Tron. But it's not a sure deal. (It's also interesting to note how Post uses Expedition Map differently, to attain midrange/late game potential rather than accelerate early on, something that it isn't able to do at all, unless we're in the Amulet of Vigor variant, which is more powerful but relies on a first-turn Amulet, wasting 4 slots for it, and generating semi-useless draws of multiple copies later). Only two weeks from his first win, JogandoPelado (which is Portuguese for Playing Naked, in case you wondered) already got to his second win. A new star is born? And here's the Berserker deck that gave it that satisfaction, while also becoming the third least expensive winner ever. It's a peculiar take on the tribe, entirely based on the dash mechanic from Tarkir block, allowing one-sided board sweeps. But yeah, Berserker is generally a strong tribe in Underdog, even in its more traditional builds. But before hearing any complaints (how is it that you guys are always up in arms against something? ), let me just say that this is inevitable: any format will always have top-tier tribes. Berserker is the Underdog's Goblins. And since it's Underdog, they're not actual Goblins (just like Soltari aren't actual Kithkin nor Soldier), which means you have in the meta all the weapons you need to stop them. Moving on, here's another tribe in the Underdog's high tier: Kor, as piloted by our current seasonal leader ScionOfJustice. 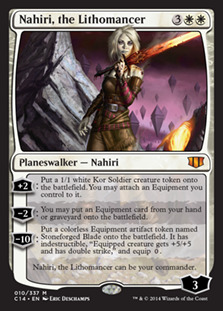 It's a strong list made stronger by all the planeswalkers (wanna ban 'em all, by any chance?). The decks tries and does what the Kor do best, which is fetching and cheating equipments into play. Of course all the really dangerous equipments aren't available in Underdog (otherwise the Kor won't be as well), so the only left that are worth it are Loxodon Warhammer and Argentum Armor, which are sort of clumsy if not supported by the Stoneforge Mystic/Kor Outfitter interaction, but still enough to justify the building of an equipment deck, which we are fine with. Right? 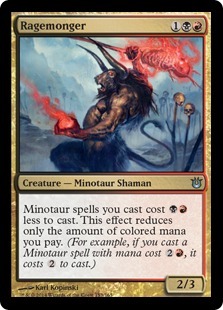 Moving even further on, Minotaur is another Underdog star (and also monstrously cheap) that's been a bit forgotten lately. Newcomers Vmonda and Armont brought them back, the former with more success. Blow those didgeridoos, fella! Finally, we've talked at length about Cloudpost, so here's Cloudpost enthusiast AJ_Impy trying the shell with an unusual tribe, Horse. 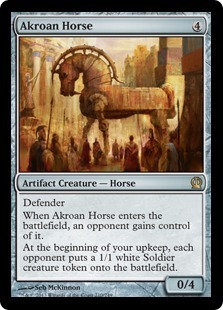 Yes, you can build a deck entirely populated by mechanical equines. Yes, all that ramp and mass destruction didn't guarantee a placement. It beat Berserker, though. The Hamtastic Award: The Biodiversity Prize dedicated to the memory of Erik Friborg has started the fourth quarter of 2015. The quarter will end December 26. By that date, the player or players who registered the greatest number of different tribes will get a 5-tix certificate from MTGO Traders. Congratulations to last quarter's winner, Generalissimo! The Achievements (sponsored by AJ_Impy and vantar6697): Unlock the greatest number of Achievements from this list and AJ and vantar will grant you 10 tix per quarter! The current quarter will end December 26. Players with the same number of achievements will split the prize. 10 more tix will be given at the end of the year to that whole season's Achievement Master. Good luck and congratulations to last quarter's Achievement Master, Generalissimo! Vote for your favorite Board Sweeper on the Topdeck Awards! "But [Cloudpost/Glimmerpost/Vesuva combo]'s actually worse than Tron..." Wow, I can't believe you would try to sell that. Which is banned in Modern and Pauper? That alone should be very suggestive to you. Two Post lands in your starting hand plus first draw are probably better than two Tron lands upwards of 95% of the time, especially considering 3rd land expectancies vs. mana potential. Four Post-lands are probably better than four Tron lands at a similar clip, especially considering the incidental lifegain. Exactly three lands still has to favor Cloudpost, though the percentage is closer. I've played against Tron in Modern a decent amount and while that third land is the full tron about half the time from my experience with Map (but not always turn 3), half the time it isn't. Even when it is, Cloudpost has several three-post hands that can meet or exceed it at the same clip, certainly after an untap, and certainly if, like the Tron example we allowed for one search. Cloudpost's sub-optimal three-post land draws are far superior to Tron's sub-optimal three-land draws. Tron is way easier to disrupt with a single Wasteland, especially in Tribal, where you can't fit as many land search spells. Vesuva also has extraneous uses which should not be entirely discounted (e.g., I've often copied enemy Cloudposts when I lacked mine, or an opponent's colored mana when I played a sub-color but hadn't drawn any yet.) Perhaps someone with a degree in statistics could spell out the probabilities more explicitly for us. The correct ban decision regarding Cloudpost may easily be to do nothing, but suggesting that the two are equal in strength strikes me as deceptive or naïve. "Yes, all that ramp and mass destruction didn't guarantee a placement. It beat Berserker, though." Instead of mocking the use of 12-post, try to appreciate the fact that he would have won far less with overcosted Horses had he not run them. Instead of gloating on the win over Berserker (as if Tron should beat burn decks as a matter of course), please recognize that those Berserkers had 12 4-drops, slowing it well into midrange. I'm sad to say that you sound bitter this week, Kuma. You talk about us being complaining and up in arms and ban-happy. I don't think anyone's "starting a war," as you put it. Everyone wants what's best for the format, and knocking down the spell level to assist the creatures should not be overly shocking or unwelcome. I think most people here are happy to agree with you to leave it alone for now on a quasi-watchlist status. Raising concerns and suggesting fixes is hardly bad. WTF?! You took my analysis of the FIRST THREE TURNS as if it was meant to represent a comparison of the power level OVERALL? Like I'm dense or something? I wrote and I quote, adding emphasis: "compare Tron and Cloudpost's mana ramping in early turns under perfect conditions". So Post is worse than Tron in early turns under perfect conditions for what concerns mana ramping up until that point (not lifegaining, not chances of winning a match-up against whatever other archetype). Because it is. You don't need any degree in statistics to know that. To achieve what the Post wants to achieve by turn 3, you can't break an Expedition Map, and you have to drop the lands in that precise order, reducing the chances of doing so consistently. It might not mean much if you're playing vs. a midrange deck, but it's the reason why Post has a hard time vs. the fast aggro tribes that are the vast majority of the meta. You skip a beat, they don't forgive you, and there's just so many Glimmerpost you can drop in the meantime. I wasn't bitter at all, I was trying to reframe the whole thing in a tongue-in-cheek manner. But I'm bitter NOW. 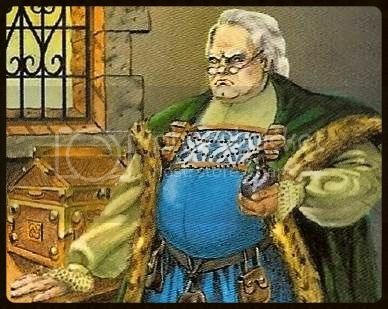 Because I'm wasting even more time discussing an archetype that, while being played very frequently, won maybe 10 events (I'm even generous here, since there's 2 Constructs, 2 Golems, 3 Scarecrows that, if you want to be honest, won because of Painter/Grindstone more than they did because of Post, plus some Gargoyle and other minor tribes). 10 events out of 248. Want to run the statistics for that? It's absurd, and unhealthy, to start a ban war based on such figures. It doesn't help the tournament, it doesn't help the players, it doesn't help me. I'll tell you this: as long as I'll be the host here, Tribal Apocalypse won't turn into the Human/Elf/Goblin Show. It's this close to be just that (again: statistically). I won't allow it to slide into that direction even further. I appreciate your stance in keeping Tribal interesting, you know full well my perspective on the issue and you have my total support. Sorry, missed the "perfect conditions" line. That's embarrassing. My bad. But in judging ban-worthiness, we shouldn't overly weigh perfect conditions (or else Mana Clash would be banned, winning the game on t.1 with 20 consecutive winning coin flips). So, I think there's still some good substance to my earlier comments. Don't get me wrong, I haven't advocated for a Cloudpost ban, and have even defended it slightly, mentioning how it is necessary for certain tribes. I've only made comments to help frame the ban argument correctly, should it go one way or the other. It is pretty broken, and far better than Tron on average, but that's not the end of the analysis. My last ban advocacy was for All Is Dust in Pure and to some extent in Underdog, and I'm even on the record for having retracted my request. I also said Emrakul was fair in the only deck I analyzed having it. We should be having a ban/purification discussion on these cards. The discussion is healthy to have even if we don't take action, and I'm sorry you think it wastes your time. I'm not a huge fan of your statistical analysis argument for deckbuilding sake, but I appreciate it has some merit in a casual format where people want to do non-broken things with broken cards. I just don't like deckbuilding around a broken card if unnecessary, just because it hasn't been exploited enough. Oh well, I can live (obviously). I think the reason why Cloudpost engine is so strong is not just because it produces so much mana, but because it gains you life while doing so, essentially giving you free turns against fast decks. Gaining 3 life from Glimmerpost/Vesuvas (but it will be much more on average) means at least 1 turn lost for an aggro deck, or discard of a 1 burn spell (both huge deals). And latter when you reach enough mana, you can start tutoring for glimmerposts with Expedition Map. Stabilizing is much easier with Cloudpost engine that with Tron engine, and that is something that needs to be considered when evaluating power level. Both Cloudpost and Tron engine are great versus slower decks without counterspells, because they will essentially start casting ridiculous stuff, but Cloudpost is also great versus fast decks. Now that additional life-gaining lands have been printed (the one that gains you 2 life, and the one that gains you 1 life for each colorless creatures), Cloudpost deck have such a redundancy of lifegaining that it feels impossible attacking them down to zero, before they stabilize. Don't confuse this as me starting a war against Cloudpost or being combatant etc., I think it's completely legitimate decision not to ban it (if I were a host, I am not sure what I would do*), I am just trying to illustrate why I think the engine is very powerful. *When you are a player it is much easier to suggest stuff etc. because you can simply express your personal opinions without feeling such weight of responsibility, but when you are a host any decision or non-decision is much tougher, at least that was my experience when I was hosting. Yes, it might well be said that I'm bluster without sweetness sometimes. My apologies. The amount of work it takes for Kuma to run the event, break it down statistically, and write it up, week in, week out for several years is incredible. I ran a chess event locally every week and submitted it for rating to the national federation for about three years. But this is far more work and the decisions far more second-guessable. So, loud and proud - THANK YOU KUMA! May my disagreements in some areas never conflate with utter awe at your overall body of work here. Thanks for your words and for being passionate enough to devote your own time to second-guessing me. I just wish you'd do in a direction that's actually helping. Me and the event. For some reason you're always getting deck names wrong. According to your above scenario, the post player would have two colorless mana on turn two. Yeah, I should have put 2 mana there, and "dropping but not breaking Expedition Map" as an action. Still the result untapping by turn 3 would be the same. Tron gets to All Is Dust faster than Post. The reason nobody (except a few occasions) ever play Tron is because with Post you get the free lifegaining and the chance to do more explosive things later, if you manage to survive. For what it's worth, I did a Gatherling check on the Scarecrow decks (search for Scarecrone) and can confirm that all three winning decks ran the Cloudpost engine. For what it's worth, I usually only run 2 expedition maps in my cloudpost myr deck. I do like having the ability to hit 3 mana on turn 2, meaning I could land a turn 2 Palladium Myr and follow that with potentially a turn 3 Myr Turbine. Turn 3 All is Dust is a beautiful thing, but it's not consistent, the drawback of lands entering tapped is real. Oh, and yeah you can play a map and crack it turn 2, but turn three you're only going to have 4 mana available to you if you do so. (Turn 1 Cloudpost, turn 2 Glimmerpost - tap for three, map and crack map, turn 3 cloudpost tap for 4 play something maybe?, turn 4 untap with 7 mana available die to the aggro deck if you don't have all is dust). Basically you can end up spending three turns not putting anything relevant on the board. All is dust, and tomb of the Spirit dragon help you stabilize, but in many of my games it is just not enough.